My dear readers, through Sandra’s story, I want to ask all of us to reflect something important in Christian life. In our spiritual life, as Christian, Where is our position now? Are we in the position as audience or player? Do we have longing and passion to become a real doer of God’s word bring salt and light through our own call? Do we only accept God’s blessing for ourselves without any longing to share God’s Blessing and be a blessing to others? Sadly, in our daily lives, there’s fact that many Christians are only satisfied to sit as audience rather than active take a role directly doing the God’s word. They have hundreds of reasons to refuse if invited to participate in doing God’s work through Christian ministry. Feel incapable, have no time, busy working, shame, and many other reasons that obstruct them to be real doers of God’s word. My beloved friends, allow me to interpret that verse word by word. “Nation” Nation means the whole people who believe in God and called as God’s child. The word of Nation don’t refer to the certain individuals or groups. Next, “the chosen people” it means not only me or you but the entire people who lives in God have a great honor for being chosen by God. Further, “a royal priesthood” Royal priesthood is a title given by God to us. It means in the eye of God we all are priests who serve the King. God gave us that title with one purpose, namely to call us to proclaim God’s great deed actively through testimonies of His work in our lives and eventually the all of nations become His disciples. Imagine how ridiculous if someone who has title as the “Royal Priesthood” or priests who serve the king just sat watching from distance without doing anything. So Let us always remember our Identity. We’re honorable people because God chose us, we are the royal priesthood that called to carry out God’s duties and command. So I think there’s no reason for us not serve God just because we feel have no ability. God has prepared us with certain ability. Therefore, let us use the gift from God to play a role serve Him and others. My beloved readers, at the end of this post I invite all of us to reflect on one thing. As a chosen people who was given the title of royal Priesthood, where is our position now? Have we done the great message that has been given to us?have we pick up the cross and proclaim the truth of God’s word to people who don’t know God? In this early year, please allow me to challenge all of us to take a real action to fulfill God’s call to serve Him. Fulfilling God’s call and serve Him doesn’t always have to be a pastor, church worker, or other position in the church but can be done in accordance with our own gift and where we are. A simple example, if we are in the office and we have gift to encourage, let’s give encouragement to those in need. Let’s prepare ourselves to get involved in God’s work. Stop doing nothing. Please remember what Jesus said, “The harvest is plentiful but the workers are few.” (Matthew 9:37) There are so many people need to be saved out there but none of that will happen if only a few people are burdened to proclaim the message of salvation from God and the great commission that written in Matthew 28:18-20 will not be fulfilled. Jesus reminds that we are the light of the world (Matthew 5:14) And because we are the light Jesus also asking us: “let your light shine before others, that they may see your good deeds and glorify your Father in heaven” (Matthew 5:16) But once again, the light will not shine and be seen by others if we just keep silent don’t do something so that the light shines. If now my little foster sister, Sandra, is able to show how beautiful the music works of Mozart, this is the right moment for all of us to begin take concrete actions to show how great God’s work in this world and how beautiful God’s love for this world. Let the title of the royal priesthood not just a designation but can be accounted for through our concrete actions as ambassadors the Kingdom of God. It’s time for us to go out of the box, time to play our part on the stage of Christian ministry, time to go and do something real. Are we ready? Amen. Talking about prayer, people have several and different ways of addressing prayer. There’re people who use prayer as an alternative to get what they want. They will be glad and give thank if God has answered his prayer, if God doesn’t answer or grant his prayer, it doesn’t matter and they will simply look for other alternatives. The others think that praying earnestly and continuously just a waste of time. They think that God already knows what we want and need so we don’t have the urge to ask God again. Some are just praying perfunctory, but once their prayer isn’t granted they’re immediately disappointed, blame God, turn their back on God and think God doesn’t care, even worse, they begin to doubt the God’s Word, even His Existence. So how do we pray? To answer the question, I took the parable of persistent widow that written in Luke 18:1-8. There was a weak widow, she portrayed as an oppressed figure, living in poverty and often being treated unfairly in society. Also there was a despotic judge. Be told that this widow continues plead the despotic judge to defend her rights. The widow said, “Grant me justice against my adversary.”(Luke 18:3) What the judge did? For some time he refused. But finally he said to himself, ‘Even though I don’t fear God or care what people think, yet because this widow keeps bothering me, I will see that she gets justice, so that she won’t eventually come and attack me!’”(Luke 18:4-5) My dear friends, I’m focused to the word, “Keep bothering me…” this means that the widow, without giving up, tireless, and persistently went to the judge and continued to asking that her request be granted. So the key of the answer above implied in Jesus’ word to the disciples. We should always pray and not give up (Luke 18:1) in other word, like the widow, we have to pray persistently! I strongly believe at the time the judge made decision not based on compassion but solely because the persistence of the widow made him uncomfortable so eventually the widow’s wishes being granted. After we know how we should pray, now let’s see why we need to keep praying persistently and do not give up. My beloved friends, based on my personal experience in praying, I found that there are four reason why we have to pray persistently and tireless. Let’s look together. Prayer is our medium to build relationship with God. Prayer is also a form of expression or declaration of our faith before God that conveyed through the word. When we pray, it shows how our faith and to whom we put faith. The quality of our faith showed by our constant and continuous prayer. Faith must be accompanied with trust, and only those who believe will praying continuously no matter what is the result. Whether it is delighting to them or not. Earnest and persistent prayer also shows how deep our faithfulness and patience. When we’re facing hard problems we pray for God’s help. The question is how big our patience waiting for the answer of our prayer also how big we put our hope to God. Impatience often becomes the biggest obstacle for us to get God’s promise and answer. Initially we pray persistently but when the answer doesn’t come as fast as we want, the intensity of our prayer decreases drastically until finally completely stops and we will begin disappointed to God and immediately look for other alternatives that probably against to God. That’s why the fervent prayer become a benchmark of how big our patience and faithfulness to God. Train us to live by faith. Our sincerity in prayer will be reflected by how big the intensity of our prayer. People who aren’t earnestly in prayer will stop quickly, easily give up and despair but those who earnest in prayer will make their life of prayer as a means to build very strong relationship and communication with God. They will not treat prayer as a “tool” like vending machine that easily can provide what they need but they use prayer to tighten their intimacy with God. There’s no prayer that is not heard and answered by God as long as we do the right prayer, with humility, not based on personal desire, fully surrender to God, and with a clean heart. However, even though we know and believe that God hears and will answer our prayers, we must be prepared to accept God’s answer of our prayers because sometime God’s answer not in accordance with things that we expect. If God doesn’t gives the answer as we wish, it doesn’t mean that God doesn’t care and loves us. Let’s take a look to 1 John 5:14, there’s a word “according His will…” this means that God’s answer isn’t necessarily in harmony with our will and we cannot force God to always give what we want. When God gives a different answer with our expectation, we have to know that it means God has another better and wonderful plan for us. Maybe it’s hard for us to accept but please remember God’s plan is always the best. I don’t know when God will answer my prayer for the second child, I also don’t even know if God will grant my prayer or not. This time, what I have to do is only pray, pray, and continue to pray tireless. I strongly believe God will give an answer of my prayer in time and also do believe whatever God’s answer is, that is the best because He knows what the best is for me and my family. I will not be disappointed and angry to God and will not think that earnestly and tireless pray that I did just a waste of time and in vain. 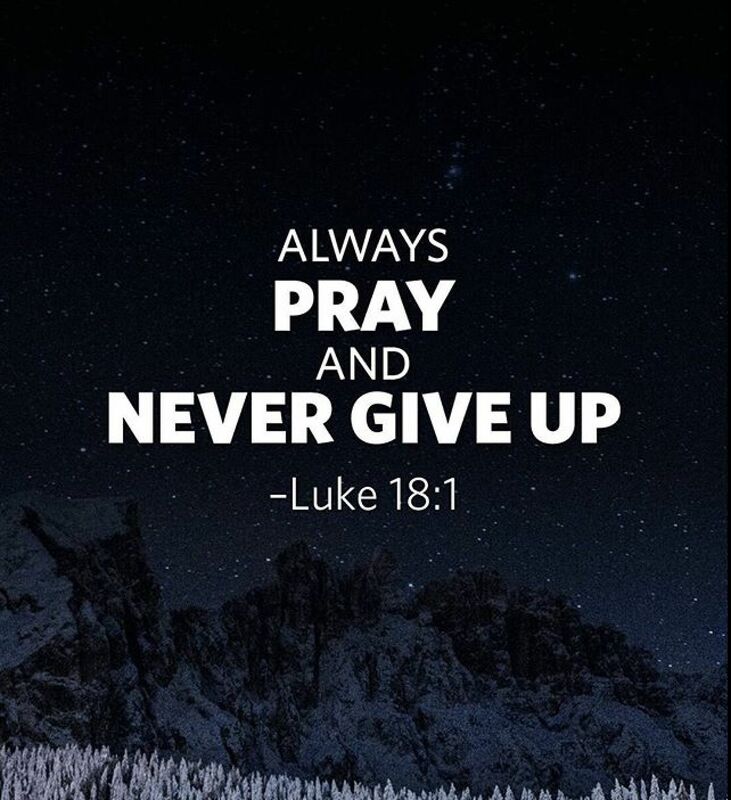 Let’s always pray, and never give up. Just waiting for the best answer from God according His will and His time! Amen. Hello my dear Readers! Here I come back with my own post. The idea of this post came out from my foster sister, Sandra who during these few days, with the different colors she wears a shirt that reads “May I pray for you?” When I asked her who you want to pray for, she earnestly said everyone who need to pray for. Beside pray for ourselves we should pray for others too. My heart deeply touched with one word of those verses. 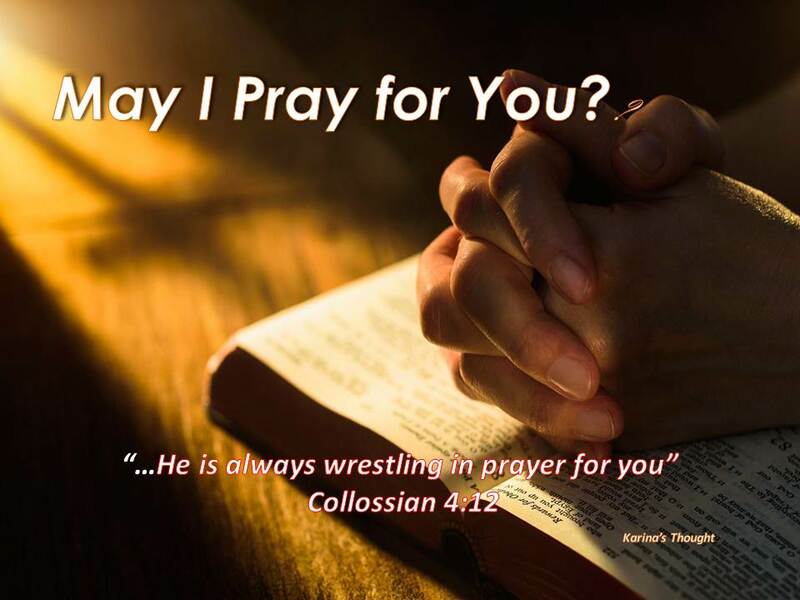 “He is always wrestling in prayer for you,” Where is Epaphras at the time? Was he in the pleasant place? No! Not at all! Together with Paul and others apostles he was in prison and waiting for death row! Can we imagine?! Someone jailed and headed to the death still be able to pray for others? Oh, what an amazing act! Normally, someone who’s in prison and will soon be put to the death will be in the deep misery, sadness, and fear. Even if he prayed, he will definitely pray for himself so that would be released from prison and free from the death! But it didn’t happen to Epaphras. He didn’t pray for his own sake. He wrestled prays for others! Even said that he always pray of others. Always, not only occasionally! What was prayed by Epaphras? He prayed for the congregation that he founded in Colossian. He wrestled in prayer so that the congregation could still stand firm, no longer as children but as mature and faithful people with all the things God wanted to. Although it had grown, he still wanted his congregation keep growing even without his presence and other apostles. He wanted they still have strong spiritual muscles, have a firm faith that remains rooted in Christ no matter of the situation! He wanted them remains steadfast in doing whatever God wants till the end. “Again, truly I tell you that if two of you on earth agree about anything they ask for, it will be done for them by my Father in heaven. Moreover, when we help to bear others’ burden through prayer, it means we are fulfilling and obeying the law of Christ. The second, praying for others is a form of love. There are two kind of love; first, love to fellow human beings. When we pray for our parents, family, or friends it means we love them. Even Jesus commands us not only to love our loved ones, but to love our enemies. The second form of love is love to God. Praying is a form of our intimacy with God and our intimacy with God is a form of our love to Him. Through prayer we communicate intimately with God and not only love but we also believe in His omnipotence in this world and that He will give the best for His people. By praying for others, we believe To the God’s power. The third reason is when we pray for others there will be a multiplication of thanksgiving to God. For this statement, I make an illustration like this: One day, my foster sister, Sandra has to face a big problem and then I pray for her. When God answers my prayer and by God’s help Sandra’s problem solved, there will be multiplication of thanksgiving to God. First, I thank you to God for He heard and answered my prayer for Sandra, the second, Sandra will also give thanks to God because God has helped to solve her problem. Prayer is a real action of our faith to God. Pray for ourselves or for others shows that we don’t have dead faith but we have a living faith and will always make live because when pray for others or ourselves we put faith as a foundation of our prayer. By faith we believe that God will hear and no matter what of the answer, God will always answers every of our prayers. My beloved friends, what about us now? Whether in our prayer list beside a series of prayer for ourselves, is there a list of other names we will pray for? Have we prayed every problems and burdens of our family, friends, or anyone who need to pray for? Have we also prayed for our church, its leaders, its ministry, its future and growth, its congregation, and many other important aspects in the church? Have we prayed for our government and its component? This evening please allow me to encourage all of us to learn from Epaphras. If in unfavorable condition Epaphras still able and willing wrestling in prayer for others, why we who have much better condition don’t do the same thing like Epaphras? It’s very important we need to pray each other. James 5:16 also said that we have to pray for each other. My dear friends, let’s make “pray for others” become our Christianity lifestyle and let’s joyfully start to get used to says “May I pray for you?” There will be no loss at all when we pray for other, even God will bless us like He bless Job after Job was praying for his friends. Therefore, I’m longing to write about the facts of Jesus ‘resurrection. This post just a reminder that Jesus has really risen! I’m interested to choose Jesus’ tomb as a topic of this post. In my opinion the empty tomb was a starting point of the entire Jesus’ resurrection story. All things that happened in the tomb and the existence of tomb itself became a controversial story throughout the human life history and will goes on. Many people scientifically strongly objected to all things that happened in the tomb. They claim that it was only a legend or myth development created by Jesus’ disciples and followers. Some other argued it just an apologetics device rather than a historical fact that can be accounted for. The extreme opinion was said that Jesus actually never arose but His disciples stole Jesus’ body. Now, let’s take a look in detail what happened at the Jesus’ tomb. My beloved readers, there was interesting thing in Jesus’ resurrection story and it becomes another absolute proof of Jesus’ resurrection. Titus Flavius Josephus, a Jewish historian, says that women weren’t even permitted to serve as witnesses in a Jewish court of law. But at the time, the fact was, the women, Mary Magdalene and the other Mary was mentioned and included as the first and main witnesses. I quote a comment of William Lane Craig about this matter; the discovery of the tomb by women is highly probable… Why women and not the male disciples were made discoverers of the empty tomb is that women were in fact the one who made this discovery. If I may conclude, the women, regardless of their status in Jewish society, were a part of grand design of Jesus’ resurrection story. The women had been plotted like that way. So if there’s an objection about women as witnesses, it doesn’t matter! Who cares! Jesus’ resurrection wasn’t a case in the court of law but a part of fulfillment of God’s promise. The happened fact the women found the empty tomb, they tell men (the disciples), the men made verification, and then they spread the word. It means the truth of the women’s testimony can be accounted for. So once again I think the idea of Jesus’ resurrection was only a legend created by Jesus’ followers is a very unreasonable idea. An event that involving trusted witnesses (though women) and someone else trust it cannot be called as legend or hoax! Now let’s look to the tomb itself. There were so many disclosed theories to break the fact and truths of Jesus’ resurrection. There was a theory said that the Jesus’ tomb site was unknown. Well you know this theory made me take a deep breath and felt really confused. The Jesus’ tomb was unknown? I think this’s (I’m sorry to say) the dumbest theory ever revealed. I’ve no idea at all why they can make this stupid theory. I think the theorists had forgotten three important fact that written in the Bible. First, the brand new, hewn out of solid rock tomb was owned by the rich man from Arimathea named Joseph a member of supreme council of the Jewish (Sanhedrin) who asked Pilate to take Jesus’ body for burial (Matthew 27: 57-60) the second thing, at the time, Mary Magdalene and the other Mary also were there (Matthew 27:61) And later after three days, those women went back to the same and exact location, as did the disciples who ran to see it by themselves when hearing from the women that the tomb was empty. The third, because of the concern that Jesus’ body will be stolen by Jesus’ disciples, then the leaders of the Jewish priest took extra precautions (Matthew 27:65). They ensured that Jesus’ tomb was guarded by groups of highly trained Roman soldiers with very strict rules. So I think those who made this theory weren’t smart enough made a theory! Joseph of Arimathea, Mary Magdalene and other Mary, the Roman soldiers, they all knew where the exact location of Jesus’ tomb! I’ve personal opinion about the tomb. Though until now still a debate about the precise location of the tomb, it doesn’t matter! For me personally, the reason why Jesus dead, it does matter! Beside guarded by highly trained soldiers, Jesus’ tombs was also sealed with Roman seal. A seal represented the power and authority of the Roman Empire. Break the seal means dead! And the ruthlessness of Roman soldiers was well-known and feared so there was no one dares to break the tomb that automatically break the seal, and steal Jesus ‘body even by Jesus’ disciples! Actually, Jesus’ crucifixion made the disciples confused, afraid, and most of them were hiding. Even Peter, who swore he willing to die for Jesus, denied Jesus three times before the crucifixion! There was unusual thing in the tomb. When the women and other people were approaching the tomb in the morning they found the unusual position of the rolled stone. To explain the stone position, Mark, in his gospel mentioned “Anakulio” from the root “Kulio” which mean “roll” So “Anakulio” (with preposition “Ana” means “to roll up a slope or an incline” I imagine something about this stone. It’s not too difficult a small number of men put the stone weighing one to two tons in place because typically the place in front of the tomb was sloped down. But isn’t so easy for a few men to roll the stone uphill to the slope. The unusual position of the rolled stone was another proof that Jesus’ body wasn’t stolen even by the disciples. It was so impossible for a few men roll the stone away secretly without being noticed by the Roman soldiers. Moreover, the tomb was guarded all the time. Periodically the guard would be exchanged. My beloved friends, actually the tomb wasn’t completely empty. Jesus was gone, but His grave clothes still there and became a silent witness and showed a supernatural nature of His resurrection. John in his gospel carefully explained the fact that the Jesus’ grave clothes were still in place. (John 20: 1-7) the grave clothes lay there as if Jesus’ body lifted out of the grave clothes. When buried, Jesus’ body was wrapped in linen cloth with aromatic spices mixed with a gummy substance called “myrrh” The myrrh will strongly adhered to Jesus’ body. Logically, let say the Jesus’ body was stolen; the thieves will work as fast as they can and take the Jesus’ body along with the grave clothes. It was so impossible and a ridiculous act the thieves take some time to separate the grave clothes and the body then again laid it out neatly. and if Christ has not been raised, our preaching is useless and so is your faith. The resurrection of Christ made the apostles’ faith drastically growing so they were daring to proclaim the God’s word and they were willing to be martyr. Jesus’ resurrection was becoming a revival of their faith. I also earnestly pray what has happened to Jesus’ disciples at the time also happens to us. Maybe we don’t have to be martyr but we’re experiencing a resurrection of faith. Our faith becomes stronger in waiting for the next fulfillment of God’s prophecies and promises, and by faith keeps watch until His second coming. Happy resurrection day from me, my husband Kevin, and Andrew! God Bless! A few days ago I was struck by news about a businessman who was arrested for committing a law offense. He was proven to commit various frauds and he also did tax evasion. I know him very well. He was a good Christian man, actually. He started his business three years ago. He had brilliant business ideas, had a good business strategy, had a good marketing plan, etc. Actually he could be a successful young entrepreneur but unfortunately he had a bad trait. He wants his business grows fast so he did any ways both legally and illegally just for the sake of his business. Too bad! Just because of his impatience then he became disobeyed to God and finally God punishes him. Besides arrested, another consequence was all of his personal and company’s assets were confiscated! It was unfortunate. Everything that had started well ended very badly. Good start, bad end! Dear readers, I invite you for a moment to go backwards to the days of Saul and imagine we’re close with Saul, also imagine the situation. People scattered from Saul (six hundred men left), Samuel didn’t come, and worse the Philistines will come. Well, what do you think? Wouldn’t it very sensible if Saul took action while the situation at the time was quite dangerous, right? So, where is Saul’s mistake? Did not Saul take precaution and rescue for the Israelites? Many people discuss that Saul’s mistake was about offered up the burnt offering. Saul was a king and offered up the burnt offering is a priest’s authority. Yes that is right! But…Saul’s impudence to ordered bring the burnt offering was just an effect and if we remain want to say it was a mistake, it wasn’t become a fatal mistake. There’s one big and fatal mistake that causes Saul fall. Let’s see… Actually, there was dealing between Saul and Samuel. Saul had to wait the time that set by Samuel. Seven days! (1 Samuel 13:8) But because after seventh day Samuel didn’t come while Saul’s men began to scatter, then Saul took an initiative to offered burnt offering. My dear friend, you know what, this’s all a matter of time. Saul cannot wait a little longer until Samuel comes. Actually the seventh day hasn’t finished yet and in fact, Samuel arrived a few moments after Saul finish offered the burnt offering. So actually, Saul’s impatience in waiting for Samuel became the root of Saul’s fall. Impatience was the biggest Saul’s fault. His impatience produces disbelief and disobedience, and the result of his disbelief and disobedience, he took over Samuel position as a priest, and worst, there was a consequence. Saul lost his kingdom because he less of two or three hours patience. Besides, this’s just my personal opinion (I’m sorry if I’m wrong). Saul had a personal interest. Saul tried to be sole ruler by concentrating political and religion power in his hand. He wants to be a hero, but he forgot that his act has been violate Samuel’s authority as a priest and it wasn’t pleasing God. Now let’s see what Samuel reaction is. Saul might have a thought that he already acted right and wisely. It turns out, Saul action wasn’t reaping a compliment from Samuel but he got the opposite. 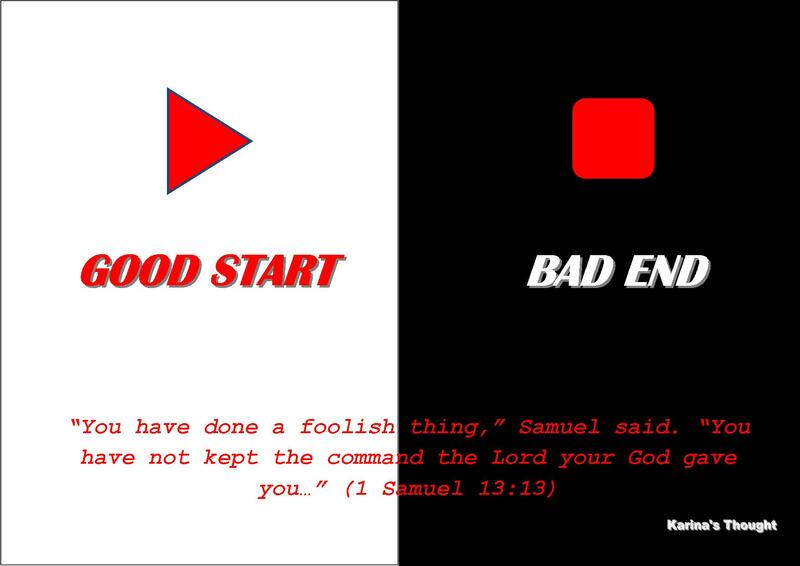 Let’s take a look what Samuel says in 1 Samuel 13:13.Samuel said, “You have done foolishly” Samuel’s reaction was clearly implies rebuke to Saul. My beloved readers, in this part we’ll see Saul’s faith quality. If we look carefully, from the beginning Saul used dangerous condition as an excuse to do something that turn out totally wrong, even Samuel said, ” You have not kept the commandment of the Lord your God” Saul didn’t realize that precisely the danger situation put his faith and obedience to a test. He didn’t realize that indeed God is testing his faith. At that time, Saul was controlled by condition not by faith. As a man who chosen by God and filled with the Holy Spirit, in the danger condition Saul should be by faith completely trust , obey and rely on God, not using the danger situation as a reason to did foolish thing. Samuel said that God will have established Saul’s kingdom over Israel forever. It means God will also control the dangerous situation at the time; God will do something for Saul and his kingdom. But unfortunately, Saul’s faith fails and loses by the condition. Saul didn’t do what has commanded by God, he already doubts God’s power, and he prefers to act according his own understanding. My dear friends, this evening allow me to use the story of Saul and the businessman as an example and reminder for all of us. Make it as our reminder to always keep and maintain our obedience and faith to God. When for the first time we take a decision to repent and accept Jesus as our Savior, we’ve already begun the beginning of our lives very well. We begin with a very good start. We receive God’s promises of protection, care and salvation as a form of His grace. But we’ve to know that not only stop there; we still have one important duty. 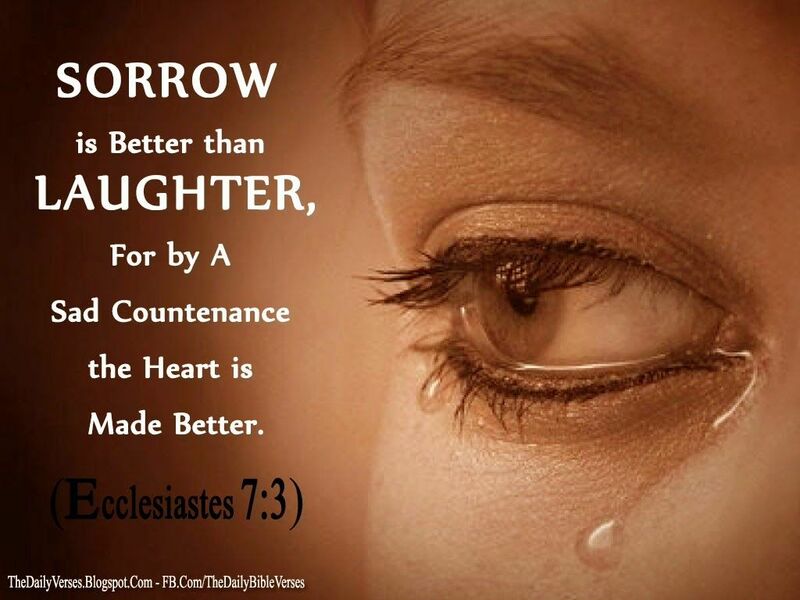 Our duty is keep our repentance and salvation to the finish line by remains obedient to God’s command. When we’re in difficult situation, in the depressed state, or surround by hard problems, we’ve to believe wholeheartedly that God has power beyond anything. If God seems silent and do nothing, let’s be patience. Actually God is always able to free us from our hard time but not according our time but in His perfect time. So, let’s be patient! I strongly believe if Saul could a bit be patient waiting for Samuel come his story will be totally different. My dear readers, what about us now? Let’s take time for a moment for self-reflection. Have we been faithful and obedient to the God’s word no matter in the hard times or not? Could we be patient waiting for fulfillment of God’s promises? Are we still able to hold our faith strong even in the most critical conditions? This evening, allow me to encourage all of us to learn from Saul’s fault. Don’t do the same thing like Saul did so make us loss of God’s blessing just because of impatience we do the foolish thing and it takes us into the sin. Don’t make God regret like He regret made Saul to be a king. We’ve to always totally aware that difficult and danger situation in our lives often become a powerful weapon used by Satan to tempt us and make us down, or sometime God want to test us to know how strong our faith quality, how obedient we are to do God’s command, and how much we patient await for the fulfillment of God’s promises. “Karin, you really like your father!” Many people around me always said like that. Yes I have to admit it. I have many likenesses with my father. The way we talk, our mindset, the way we handle problems, and many more likenesses. Still remembered until now, when I was a kid, if anyone asked “what do you want to be when you grow up?” Confidently and firmly I replied, “I want to be like my daddy” I really idolized my father. From him I have learned so many precious things. He taught me about the meaning of life, he taught me about humanity, from him I learned about true love, How to sincerely love one another, he also taught me about how to have empathy to others, and many other important lessons to live this life. We’re Different with another God’s creation, we’re created very special. We were created in the image and likeness of God. Not physically but in character. It is very important to be implanted in our heart. Paul stresses the importance of living like Christ and describes his longing to see the fulfillment of this ultimate goal could be happen. He said, “My dear children, for whom I am again in the pains of childbirth until Christ is formed in you,” (Galatian 4:19) in other word, That Paul willing to suffer again, like a suffering mother in childbirth so that Christ’s image is completely and permanently formed or molded in us. What and how God’s characteristic is? Actually it’s easy to know and understand God’s character. God has given the way to know His character through Jesus Christ who came to this world. Generally, Christ – likeness encompasses two aspects, namely: First: the mind, attitude, and Christ’s heart. And the second thing is Christ’s character/ Integrity. Easy to know but it turns out isn’t easy to apply in our lives. Honestly, I have many times met Christians but they exactly don’t reflect the character of Christ. Instead they more reflect the worldly characters. For example, by chance I involved in the business world and really know how cruel the business world. I found so many sly businessmen. They can do anything just for the sake of their own business. They could run their business with dirty way, They compete unfairly, they in a sneaky way can turn off the business of others that runs the same business with them, and you know, I got a sad fact that not a few of them are Christians. They assume that Christianity and business world are two very different things that cannot be mixed. They argue that Christian doctrines aren’t related with business rules. Business will be difficult to grow if always stick to the Christianity. Once again I remember when for the first time I started to take over my parents’ businesses, my mom and dad give me myriad of advices and it all based on Christian doctrines. This proves that the Bible also deals with issues of how to run a business based on Christian teachings. My beloved readers, this evening I want to ask all of us to seriously take time for a moment. Let’s think, ponder, and make an evaluation. How our spiritual life as Christians right now? If we claim to be Christians and live in Christ, have we already reflect two aspects of Christ’s character through our behavior, deeds and lifestyles? Have we succeeded in getting people around us say: “Oh, their deed and behavior are truly reflecting the figure of Christ” Or even otherwise we are simply becoming a stumbling block to others? Let’s examine ourselves whether each thing we think is already in line with Christ’s character. Let’s evaluate again the way we think, the way we behave, our temperament, attitudes, character, integrity, and we have to make sure that it all still leads to the Christ. Do we already have a solid and genuine Christian character or we as if have “Split personality” that could be changed any time as needed and then people around us will labeling us as hypocrites. Personally I have to admit it’s not easy to become Christ-like. Not infrequently I have to experience a struggle when I try to always reflect the character of Christ in my personal life. As long as we live in this world, it’s not easy to always reflect Christ’s character because there are many things in this world are opposed with the Christian teachings. That’s true but isn’t an impossible thing to do and we have to remember one important thing that if anyone in Christ, the new creation has come the old has gone, the new is here! 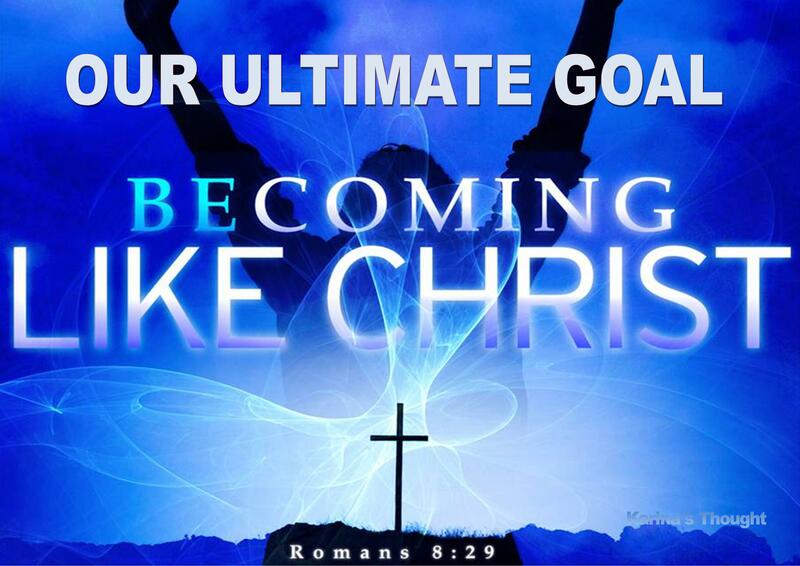 (2 Corinthians 5:17) As a new creation, we have to put off our old behavior and habits and day by day we should continue to experience renewal and increasingly get an Image of Christ and we continue to proceed to become Christ-like.